One of the things I love most about living in America is the richness of its melting pot of cultural traditions, and its inherent diversity. When each of our families came to America, we all brought our own cultural traditions, and those traditions gradually mixed into a constantly evolving American identity - and an ever changing American cuisine. This reshaping of the American culinary identities, based on the cultural traditions of people from all parts of the United States (as well places outside of the United States, as the world becomes more global) is one of the reasons that I started this food website with different writers from places all over the United States and Canada. Tonight, I noticed similar themes expressed in the epic Iron Chef America Battle tonight between Bobby Flay and Mario Batali that I watched while preparing this. (We can save my obsession with the White House Kitchen Garden used in those recipes for another day). I love cooking using all of these different traditions combined with traditional cuisine and not only my own heritage (Ashkanazi Jewish, Eastern European and Swiss). 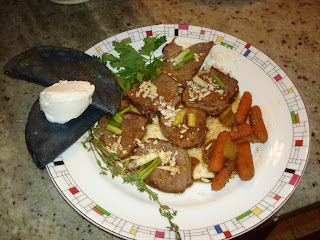 Tonight's recipe uses one of the new featured indedients for the month of January on Akitcheninbrooklyn.com, lamb, prepared in a traditional way, by braising a boneless leg of lamb, mixed with flavors of the American Southwest. If you are interested in other ways to prepare lamb, you can find my New Years Eve recipe for rack of lamb with fresh herbs here. Inspired by Bobby Flay's Mesa Grill Cookbook, I prepared a similar southwestner-inspired lamb, rubbed with ancho chile powder (which I must emphasize, is not spicy at all). Chef Flay's recipe (which differs significantly from mine, but certainly inspired me) is on page 172 of his cookbook. Both my recipe and his are attempts to combine a pretty traditional dish - leg of lamb - with flavors of the southwest, in a way that makes sense from a culinary-taste perspective. First, like Bobby Flay in his recipe, I rubbed the leg of lamb on all sides with the ancho chile powder. I used the powder sparingly to creat a full coat, so I cannot begin to quantify how much I used. Ancho chile powder is not spicy - it is made from dried polambo peppers and has a raisin like taste. Next, I heated the canola oil in my dutch oven on medium high heat, and seared the lamb on all sides, which took about 10 minutes. Then I added the carrots, celery and onions to the pot and mixed for a minute or two. Next, I added the braising solution - in this case the chicken stock, and seasoned sparingly with the thyme, bay leaf and rosemary. I then put the entire pot in the oven at 350 F and cooked for about an hour and a half, until it was fork tender. Next, I removed the lamb and the vegetables and prepared the sauce. (Actually, my husband Brad did this part, while I worked on the spiced-pumpkin creme brulee that I will be writing about in the next couple of days). To prepare the sauce, we strained the liquid from the braising solution into a saucepan and boiled until reduced to a sauce for about 20 minutes. As you can see from the picture, I served the dish in a blue corn tortilla, with scallions, parsley, creme fraiche and cojita cheese (which Bobby Flay described as a firm-textured Mexican cheese that is today generally made from cow's milk). The carrots and celery are much to tasty to go to waste, and make a nice side dish. You can purchase blue corn tortillas and fry them to serve, or if you prefer, it also makes a tasty lamb dish on its own with the vegetable side. Sounds delicious! It is really hard for me to find good lamb meat out here at my local Milwaukee-area grocery stores, unfortunately. (Aldi's has the best selection, if you can believe it). I love ancho chile powder, but I like guajillo chile powder even better. It's got a fantastic sweet-and-hot flavor. People who like more heat might want to mixed in a little guajillo powder in the dry rub. Mmmm! That's a great suggestion! 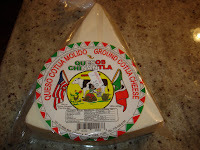 I will have to try incorporating guajillo powder next time as well.